When reading the descriptions of some GSDs in the pedigrees, I often see the term “good character”. Is this just about basic temperament, sociability or stability? Or is it something very specific? It can mean whatever the person wants it to mean. It's not an officially recognized term, like for instance, Härte, Mut und Kampftrieb (hardness, courage and fighting drive) often seen in official Koer reports. Though a dog that had the above attributes would definitely have good character! Are you seeing this term in the Koer reports of these dogs? If they have been translated from German to English, the translation may not be accurate. For instance, 'guter ausdruck' can be translated as 'character' but (if I'm not mistaken - my German is far from perfect) it refers more to the dog's appearance than its character. I agree that the term is very subjective. A lot depends on what the dog is going to be used for. A perimeter or property protection dog might be best served with traits of mistrust, a low threshold for defense and confident sharpness. Some might see such a dog as lacking in character, but in reality, that type of dog is going to do a much better job in his role than a super social, high threshold for defense dog that is not sharp. I see the term character as better applied to people than animals and prefer to determine what traits, such as nerves, drives and thresholds a dog has. There can be many different combinations of traits in different dogs and some would generally be described as having good character and some would not. A lot depends on what type of dog a person prefers in addition to the role it will serve. Thank you for your replies.. Yes, it was translated from German and is referring to a stud that is used in breedings for "Schutzhund " competition. @Sunsilver, yes you are right. It says "guter Ausdrek". I see this on many. 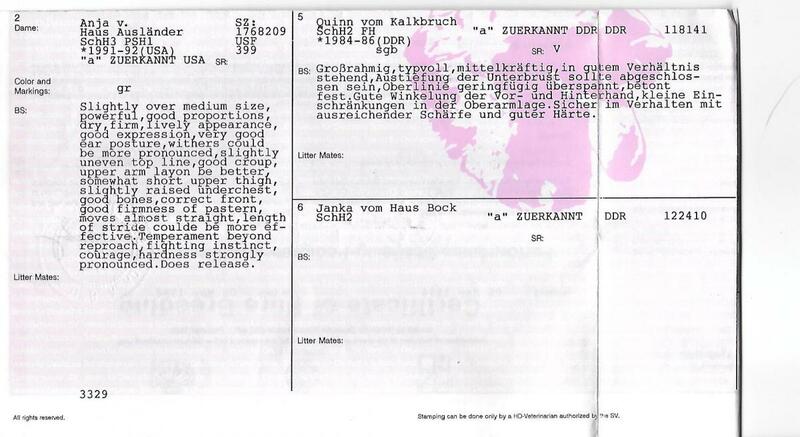 As far as I know "good character" is not used in German koer reports - wouldn't make sense. Guess, it's a translation mistake. In case you do have the German original I might be able to help. Sun may be right - Ausdruck (expression) wrongly translated into character. Okay, 'guter ausdruck' is most often translated as 'good expression' rather than 'good character'. It refers to the dog's appearance, and I think means the dog is true to type, and has the keen, alert expression a GSD is supposed to have. If someone who's a native German speaker wants to comment on this, please feel free to correct me if I'm wrong. Wesen sicher, Härte, Mut und Kampftrieb ausgeprägt; läßt ab. @Sunsliver Yes that is exactly what these descriptions say! Thank you! Here is one slightly different because the mother (DDR) had her survey in the states. Maybe Susie or Sunsilver can explain Gildo's survey.